I'm going to give my inner gear-geek a rest. We'll wrap up that "What-to-bring-on-a-stand-up-paddle-surf-trip-to-mainland-Mexico" piece next time. How about a couple of surf photos from down south? Sound good to you? Check these ones out. Sure was a good time... can't wait to do it again! Photo: Mercedes and Chico. 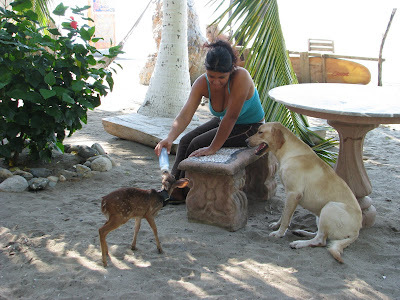 Chico is the baby deer that Lourdes (owner/proprietor of the bar/restaurant on the point) found on the highway. Chico roams the point, sleeps with Lourdes' two dogs and comes in every now and then for a little feed from the baby bottle. I'm sure it won't be long before he's ripping the point. Photo: I'll call it "Up the road", if you've been there you know where it is. A good, fun, non-life threatening wave. 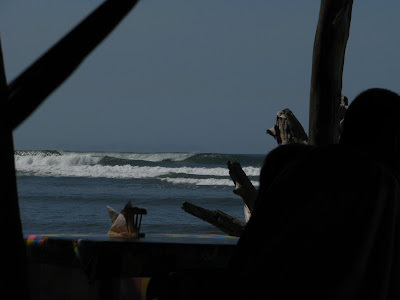 Plenty of lonely waves to be surfed if you have the means to paddle away from the ten or so guys surfing the main peak. Check this one out, running both left and right, empty the whole time we were there. Photo: "Out in Fronts" doing it's thing. Super long and really fun. It's about time there Johnny Boy! So where are the really good pics? Oh I forgot you didnt have your number one photog with ya lol!